INTO THE WOODS DVD Review | Warped Factor - Words in the Key of Geek. Tony Fyler’s away with the fairies. Fairy tales have been the stuff of musical interpretation at least as long as Disney has been a big name – the studio may be known around the world as The House of Mouse, but its longevity has been built on the backs of a lot of singing princesses, handsome princes and comedy sidekicks. 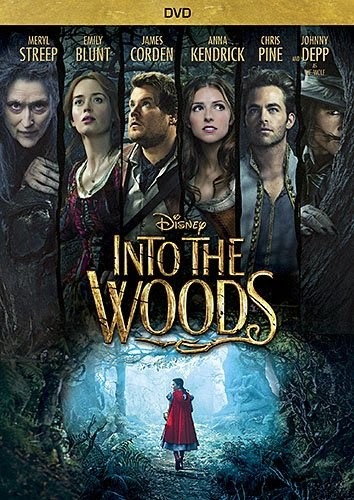 It’s fitting then that Disney should bring Stephen Sondheim’s story Into The Woods to the screen. What’s pleasingly brave is that the studio known for its sometimes sickly-sweet endings commits to bringing all of Sondheim’s story to the screen, rather than – as many theatrical productions do – ending on the happily ever after. Into The Woods is a pleasant, working oddity, which blends and weaves some of the finest of the Grimm Brothers’ creations into an at least vaguely coherent fantasy quest musical. The witch from Rapunzel has placed a curse on the house of the baker and his wife, both of whom really want a child but can’t have one, as the curse ensures the baker will be barren. In order to lift the curse, the witch requires four magical objects – a cow as white as milk, a cape as red as blood, some hair as yellow as corn and a shoe as bright as gold. She gives the baker a handful of beans from her magical garden with which to bargain if need be, and the story ramps up – Red Riding Hood skips off into the woods to see her granny. Jack is sent by his mother to sell their cow, Milky White, at market, Rapunzel’s up in her tower and Cinderella begs to go the ball, then runs to her mother’s grave-tree… in the woods. All of them have an object the couple needs to break the curse and get pregnant, and the items, if brought together within three midnights, will also lift a curse on the witch herself, making her young and beautiful again. So far, so good, so Grimm. The new movie version aims more for an anchoring believability than many incarnations – with James Cordon and Emily Blunt playing it absolutely modern as the baker and his wife. 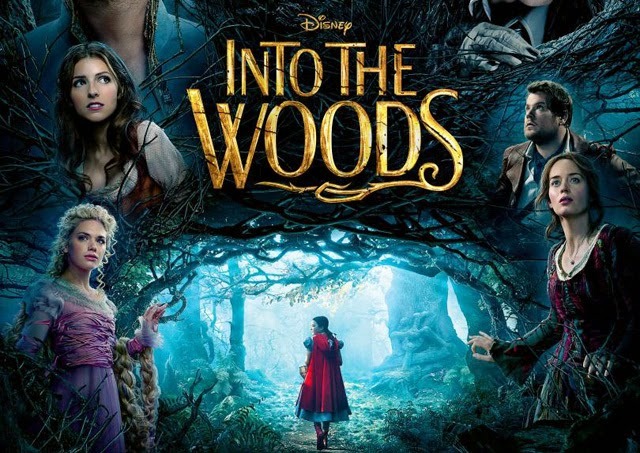 But the anchorweight of these performances, along with those of Anna Kendrick as Cinderella, MacKenzie Mauzy as Rapunzel, Lilla Crawford as Red Riding Hood and Daniel Huttlestone as Jack are counterbalanced against the fairy tale grotesque elements, including Meryl Streep’s singing witch, Tracey Ullman’s mother to Jack, Christine Baranski as Cinderella’s stepmother, Johnny Depp as the wolf, and Chris Pine particularly as Prince Charming. It’s a delicate balancing act, this ordinary humans Vs fairy tale people business. But for the most part, Disney delivers the potential for self-mockery very well. Again, Chris Pine in particular is memorable for his Prince – he seems to channel Richard Burton, and then camp it up mercilessly, and his duet with his princely younger brother, played by Billy Magnussen, is a thing to behold. You’ll never quite look at James T Kirk in the same way again. There’s a perfect fade-out point in the structure of the play that’s faithfully replicated here – everyone’s married the right people, the baker and his wife have their baby boy, Jack and his mother are rich, Red Riding Hood has got her new wolfskin cape and all is well and good. Many Disney-inspired theatrical versions fade out on a song there and preserve the myth that everyone lives happily ever after. But that’s not the end of the Sondheim version, and it’s to be commended that it’s not the end of the Disney version here either. It would be too much of a spoiler to explain exactly how things go wrong, but there are at least a couple of infidelities, at least a couple of deaths, one big witchy wig-out and a wave of outright devastation that forces our surviving heroes to pull together and look at their world in a whole new way. In a rare misstep, there also seems to be a realisation of the humanity of one’s enemies (which modern audiences probably won’t fail to interpret as a reference to the likes of IS), immediately followed by the execution of a plan to kill the enemy anyway, slipping straight back into moral absolutism. The performances range in quality, but Sondheim’s writing is actually the factor that pulls them through so that even those with less naturalistic singing voices rarely if ever disappoint on screen, and you’re left with an appreciation for fairy tale, folklore and social storytelling as a way into the collective unconscious that you don’t need to have had walking in the door. You’re also left having had some fun, and remembering – if not ever quite singing – some of the songs. Into The Woods is a fun hour and a half, with some properly comic performances that undercut the ‘serious actor’ credentials of some of the stars. It’s worth seeing at least once if you’re a fan of fantasy stories, fairy tales or musical complexity. Otherwise – not one for you.